Books and other published materials constitute the bulk of the Klingenstein Library’s collection. 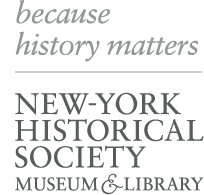 These include current monographs and supporting sources on the history of New York and the United States, as well as an array of religious tracts, city directories, atlases, rare Native American language dictionaries, contentious pamphlets of the American Revolution, pro- and anti-slavery literature, Civil War regimental histories, institutional annual reports, and travel and entertainment guides. Search for these through the Klingenstein Library's online catalog.